This luxury 4-night safari visits a mixed water and land camp in the Okavango Delta and the true wilderness area of the Selinda Concession. 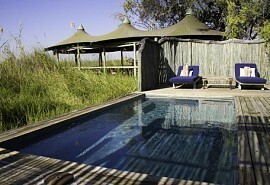 Guests will experience the beauty of the Delta, as well as the big game experience of the Selinda area in the Linyanti. Activities include mokoro (dugout canoe) rides, boating, game drives and bush walks. Guests will be accompanied by expert guides who will create a better understanding of the African bush adding infinite value to the experience. On arrival at Maun airport, guests will be met by a representative and assisted to their light air transfer to Tubu Tree Camp where they will be staying for 2 nights on a fully inclusive basis plus game viewing activities. Activities here are dependant on the water levels and include mokoro rides and boating, unless the water levels are too low. Guided walks and game drives are also an option with the highlight being a sundowner cruise when water levels allow it. 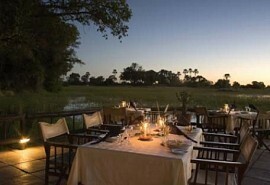 Tubu Tree Camp is situated in the Jao Concession in the magnificent Okavango Delta. Tubu Tree Camp consists of 5 traditional safari tents situated on raised wooden decks, offering breath-taking views. Each tent has a private deck, ensuite bathroom facilities and an outdoor shower. After breakfast and morning activities, guests are transferred by light aircraft to Selinda Camp for 2 nights on a fully inclusive basis plus game viewing activities. Activities at Selinda Camp include game drives, night drives and walking safaris. Selinda Camp offers only 9 luxurious guest tents with ensuite facilities, therefore ensuring a private and personal safari experience. The Selinda Reserve is known as one of Botswana's best wildlife 'concessions' or private reserves that offer all the privacy that Botswana is known for.